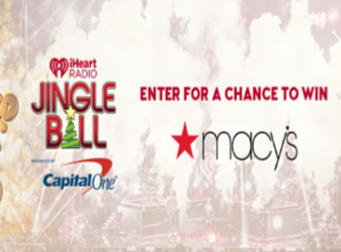 Macy’s iHeartRadio Jingle Ball Sweepstakes – Win a trip to NYC & more! Win a trip to NYC for the Macy’s iHeartRadio Jingle Ball! ENTER SWEEPSTAKES HERE – Macy’s Sweepstakes page. ENTRY LIMIT – Limit: One (1) entry per person/email address/household per Day during the Sweepstakes Period. SWEEPSTAKES ENTRY PERIOD – Sweepstakes begins on October 29, 2018 at 6:01:01 a.m. ET and ends at 11:59:59 p.m. ET on November 18, 2018.
four (4) tickets for the Grand Prize Winner and three (3) guests to attend one (1) night of the “Jingle Ball Concert” in New York, NY on the night of December 7, 2018. WINNER’S LIST – For the name(s) of the winner(s) send a stamped, self-addressed envelope, to: iHeartMedia + Entertainment, Inc., Macy’s iHeartRadio Jingle Ball Sweepstakes at 32 Avenue of the Americas, New York, NY 10036.